THIS IS A PRIVATE EVENT! BY INVITATION ONLY! Music Mentor Books of York, England are to publish an extensive reference work about rock'n'roll's most influential guitarist and composer, Chuck Berry. 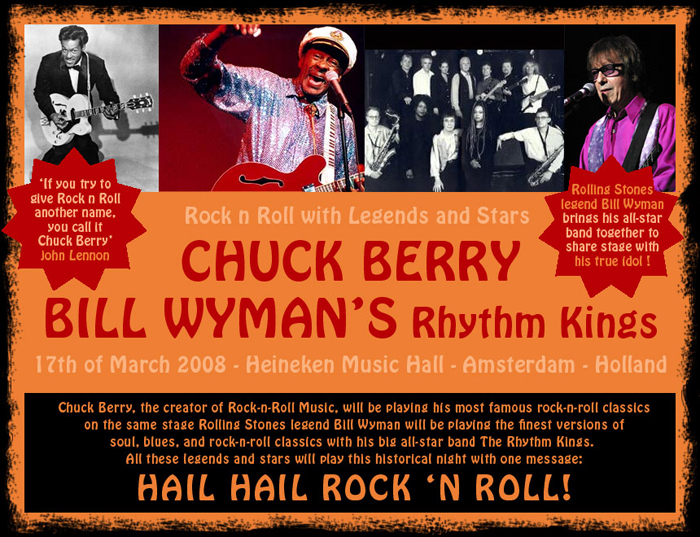 Compiled by world-renowned Norwegian Berry collector and expert, Morten Reff, THE CHUCK BERRY INTERNATIONAL DIRECTORY will appear in four volumes. Each volume will be around 500 pages long and will retail for GBP 24.99 (approx US$ 50.00). Volume 1 is scheduled for publication on 15 April 2008 and will contain discographies for over 40 countries, plus dozens of rare label and sleeve illustrations. Volume 2 will be published later in 2008 and will contain details of bootlegs, radio albums, movies, TV shows, video and DVD releases, international tours, Berry's achievements and awards, his songs, roots and influence on other artists, tributes, Chuck Berry in print, fan clubs and websites, plus annotated discographies of keyboard wizard Johnnie Johnson and the ultimate Berry copyist, Eddy Clearwater. Volumes 3 and 4 will be published in 2009 and consist of a massive listing of around 4,000 cover versions and some 800 soundalikes on record, in the movies and on TV that bear testimony to Berry's immense influence on Western popular music over the past half-century. For more information, or to order online, visit the publisher's website: http://musicmentor0.tripod.com. On February 6, 2008, H�RZU, Germany's leading television program magazine, will once again award the GOLDEN CAMERA to honor exceptional achievements in the areas of television, film and entertainment. The ceremony will televised by ZDF on Friday, February 8, 2008. This year's Lifetime Achievement Award Honoree is CHUCK BERRY! The ceremony takes place at Ullstein Halle in Berlin, Germany. Tickets are not available to the public.